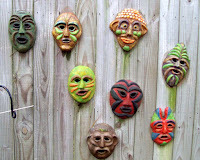 Recently while reading in the Self Taught Artist Blog I came across this incredible picture of concrete faces on the side of a wall. They called to me. I set them as a background image on my laptop and look at them frequently. Paula captured their feel wonderfully in her photograph. This lone picture started me to thinking of concrete; a concrete longing you may say. Just when I thought those days were over. 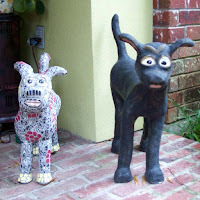 Now, I'm surrounded by concrete art that I created between 2001 and 2005. 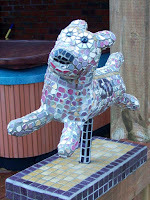 The thing about all my concrete art was I had no interest in marketing or selling it ... just creating more. It became an obsession for quite awhile. The 'I Wonder' and 'What if' syndrome. So, when one piece was finished and I needed the space to start the next, I simple moved it to the yard; plenty of space out there. And, so it went. And, its still there; partof the landscape and for the most part, something I mostly don't even notice. But, as I was saying, concrete thoughts started again with the site of Paula's photo. Calling me. I finally gave up, and stopped by Home Depot last week and headed to the concrete/mortar department. It was like 'ole home' week. I went up and down the aise a couple times looking at all the choices and decided on ONE 60 pound bag of topping mix. Beau just smiled when I got home and offered to haul it to the shed for me. I want to create some more faces, however, must have a full day open to do so. Sandcast the mortar, let it set a couple hours and sculpt. But, there's been holiday and/or family obligations almost every day and I'm still waiting for the window of available, uninterrupted time. I can hear it; concrete calling. I've been putting away all the little beads and findings; they were interesting but really, enough is enough. I'm not sure what I'll do with all of it ... maybe a now and then thing; maybe not. 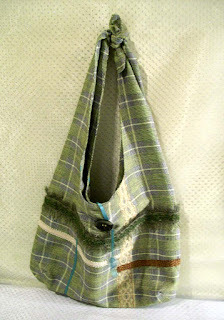 I've decided to make a couple more purses. 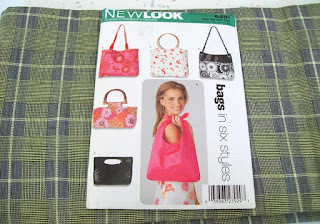 I want to get a little sewing experience before I start experimenting with fiber arts and purses seem as good a place as any to start. It's also, potentially, a bit productive. I can always find someone who would like a purse, a family member, Grans Thrift Shop, etc. Pulled out pattern New Look 6391 and a selected green plaid fabric for the outside and a yellow for the inside, along with a few pieces of braid and ribbon. This one was easy; three parts. 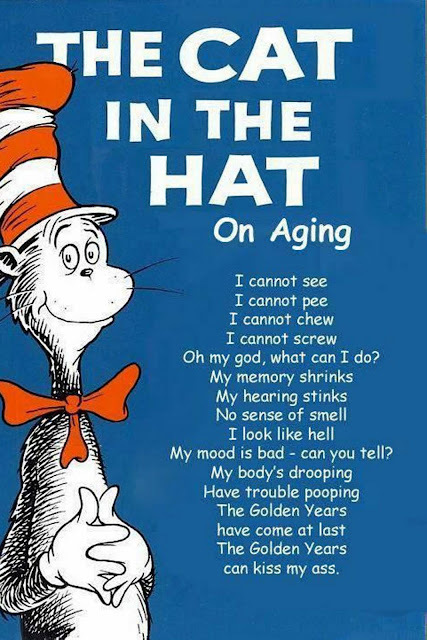 And, what did I learn? Well, when sewing ribbons, it's a good idea to change out to matching threads each time so that any non-straight lines will not be so apparent. At Thanksgiving, I asked my 12 year old nephew if he liked Jewelry and he hold me 'he hadnt been introduced to it yet'. Such a great answer for a young man his age. I'd asked as I was thinking he was a good age to give simple jewelry pieces for Christmas, and his answer confirmed that. I saw these beads last week at Hobby Lobby and thought they might be a good fit for him. 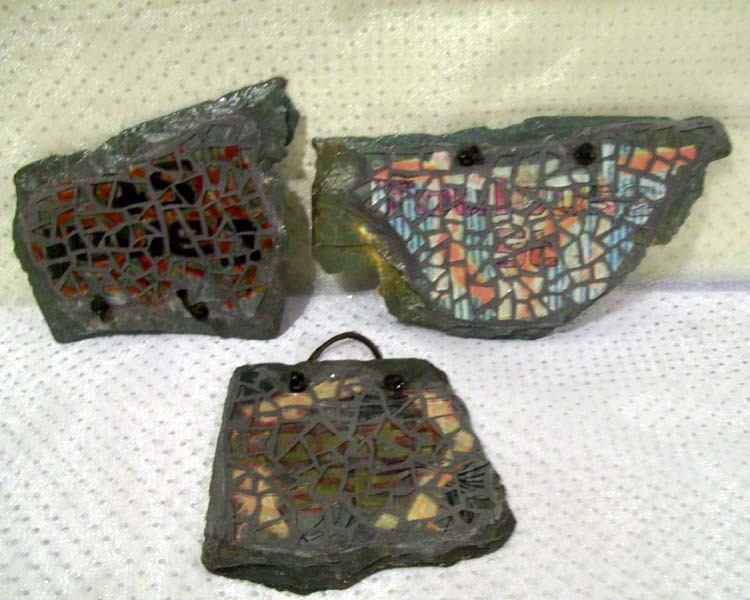 The have the feel and look of rock, but they are lightweight, so I assume some type of resin. When I got them home, however, I realized the hole was much to small to string on a leather cord and was about ready to discount the whole idea, when it dawned on me ... I could re-engineer them with a solder rim. So, I soldered three ... One from my nephew, one for Alex best friend Paul, and one (still lacking the cord), which I'm donating to Grans. I hope they will be liked. Of late, I've become enthralled with the 'Next Blog' button. You know, that one on the top Blogger Tool bar on the left ... Next Blog. Sometimes I'll spend a hour or two at a time just doing the 'Next Blog' thing just to see what comes up. Recently I discovered the Blogger made a change whereas it somehow decides what category your blog is and then when you press the 'Next Blog' you will be taken to blogs of similar type. 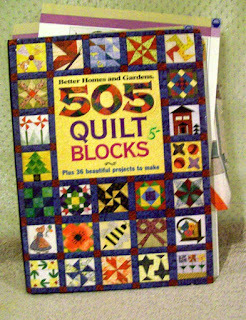 Which brings me to wonder, just what is it in my blog that thinks I'm a scrapbooker or a quilter because that is largely what I receive. But, periodically, among all this, surprises will pop up. Favorite photo of the day .. 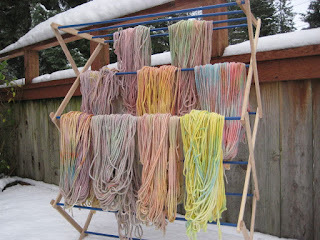 This is a photo of yarn that has been hand-dyed by a group of toddlers and is drying over ALOT of snow in Alaska. Such contrast on context. Here's the link to the whole story, by Wendy of 'Something for Sophie. The second piece that caught my interest was a post, article really, by Hilary Pfeifer, which she calls Something to Think About. This is an excellent piece regarding art and music and perceptions. If you have the time, or inclination, it's a 'must read'. As a result, I'm going to make an effort to more often stop and took a better look at what's going on around me. Faux Beach Glass ... the subject brings back such fond memories. I used to go out early (once in awhile) on Tuesday mornings, under the guise of taking a walk, and rummage through the neighbors recycle bins. Early mornings for two reasons; 1) often the recycle truck came before 8am and 2) we live in a somewhat uppity neighborhood that doesn't look too kindly on that type of thing ... or perhaps the neighbors just don't like one to know how much, and what, they drink. I was quite selective, looking for specific shades; of course, Skyy Blue Vodka bottles, being among the favorite. Once home, I'd clean the bottles in the sink, removing the labels, take out to my studio. I'd start by breaking the bottles with a hammer. It's quite amazing how strong these bottles are, you have to hit them in just the right place to get them to break (and the grocery wraps our bottles up like they are so fragile). Then, using my two-wheeled cutters, I'd the them down into usable portions. Then, off to the rock tumbler, where the glass, about 1 cup at a time, with an equal amount of sand, would tumble anywhere between 1 and 3 days. 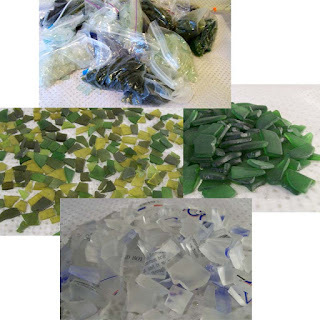 Then, the glass is cleaned, set out to dry and put up for future use. 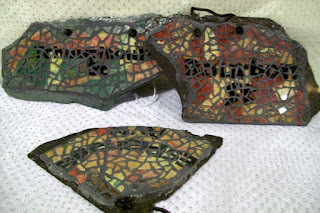 I repeated this periodically; and then two things happened; I stopped doing mosaic work and Hurricane Katrina came through and wiped out all recycling in this section of the country (thus my loss of bottle supply). So, I've this container out in the garage of the remains of my faux beach glass that I drug in this afternoon. 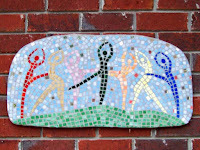 I'm going to list in it the Artfire shop, and what I hope mosaic artists will see as a good price, to see if anyone is interested in it. They anger the well intended. Those simply in the wrong place at the wrong time. Perhaps more subtle; perhaps not. Today I was supposed to put up my tent and participate in the Northshore Art Market in Covington. But, it was cancelled yesterday with the projection of 100% rain, weather in the low 50s and wind gusts. Not great weather for an art market and it was cancelled ... the $50. fee will carry over into January. So, we spent the day tucked inside. Yesterday was my birthday and my present from Beau was a new 6' cabinet (with doors to hide the mess). He sure knows the way to my heart ... doors; to hide the virtual mess. He put it together for me and I spent part of the afternoon organizing to fill it up. Tomorrow he's going to cut me a couple more shelves and on Monday I'll pick up more shelf pegs. I love it. 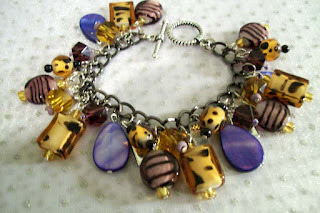 I also put together the bead sets and completed Aimee's bracelet. Originally I put on Scabble letters spelling her name, but it didn't look right ... the pendants being to chunky and just didn't lay nicely. So, removed them and added in a few silver trinkets ... stars, a phone, windows and such. I'm pleased with how it turned out and I hope that she'll like it (particularly since I don't really know what her taste in accessories are). I have 6-8 presents that I plan to make this year. 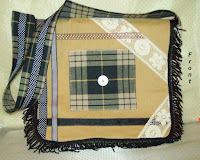 A couple days back, I started on the first of the lot, a big messenger bag for our neice, Shannon. 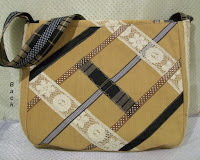 Shannon is a remarkable young lady and I wanted the bag to be something other than the norm. I also wanted it to be something big that she could haul stuff around in ...and thus, a messenger bag. It's a very simply pattern, but was quite time consuming sewing on all the little bits and pieces. Here's the front and the back ... it's also detailed under the flap and has three pockets on the inside for the smaller stuff. I think she'll like it. 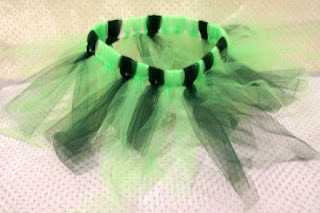 I'd picked up some bright green tulle the other day to complement the dark green I already had to make a Tutu for Lilly. Her momma told me that green is her favorite color. The tulle strands vary between 5 and 8" on this piece and I stitched the tulle at the bottom of the elastic and I thought she might work at untieing the pieces (which wasn't necessary for Stella's piece). She will be absolutely adorable in this (not that she's not adorable anyway). Several weeks ago I decided I was going to make Aimee a charm bracelet ... purple and gold beads for her favorite team and her name in Scrabble letters. I'd purchased the beads and then set them aside. Actually, I set them aside so well that when I went to pull out everything to start the bracelet last week, I couldn't find them. Beau kept suggesting I just go buy some more, which I finally did on Wednesday. And, or course, when I pulled everything out this afternoon, I found the original beads .... I'll pull out the findings tomorrow and put this one together. Lilly came to visit for a couple of day. She's such a joy ... and a big helper too ! Another moral dilemna, what should be done with bad art? You know, those pieces that started out with the grandest of ideas and then just didn't turn out as intended. I know I've had my fair share and assume most everyone who creates (whatever it is they create) also have their share. I had this idea; I'd create small paper collages depicting New Orleans street signs, on pieces of slate that came from the Nature Center. 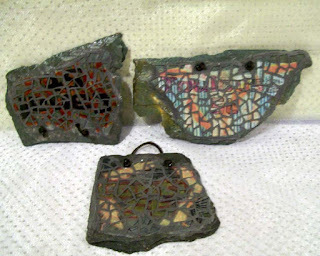 Then, I mosaic clear glass over the tops and drill holes for hanging. And, so I proceeded ... start to finish ... the vision leading me on. 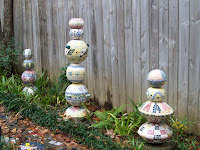 And then, when they were finished, all 12 of them, I lined them all up for a couple photos. BUT, the colors and design of the paper collage didn't jump through the glass in a clear and concise way. In fact, on a few, the street names weren't really discernable. THIS WAS NOT MY VISION. But, there were still my pieces of art. They were not only not good enough to consider selling, I wasn't even interested in hanging them on my own walls. But yet, it also didn't seem right to haul them out and toss them in the trash; after all, resources, materials and time were invested. So, I wrapped them up and stuck them in a cabinet to get them out of my way while I decided what to do with them. Well, it's been abit over 5 years and I just so happened to get into that cabinet today (for something else), and, of course, they are still there. Such a dilemna ... they don't look any better than when I put them there. So, after a long dinner discussion, Beau helped me reach a decision. I'm going to give them to Gran's Attic (the local Thrift Shop that helps those that need help with their proceeds). Let them decide whether to put them in their shop to sell for a dollar or two; or perhaps throw out themselves. I'll never have to know. Like I've said before ... just because it's handmade doesn't mean its any good ; let alone art. I started thinking about transferring a couple to graph paper to enlarge, when inspiration struck. Why don't I just scan these into my computer, then to a disk where I can print them to any size I want and just cut apart. So, I pulled the scanner out of the closet and set it up in my room. Then, as I played with other things in my room, I went back and forth on the moral dilemna ... Destroying a Book Just Feels So Wrong. It makes it worthless, and can no longer enjoyed with a cup of coffee or shared with a friend. Then, the other side of reason said, heck, I paid my money; who cares. And, back and forth and back and forth. In the end, 'who cares' won out and I pulled out the box cutter and ripped out the binding. Now, for the next couple days, each time I pass the scanner, I'll feed through another page until all 505 images are appropriately captured. Then, I'll list the book on FreeUse. 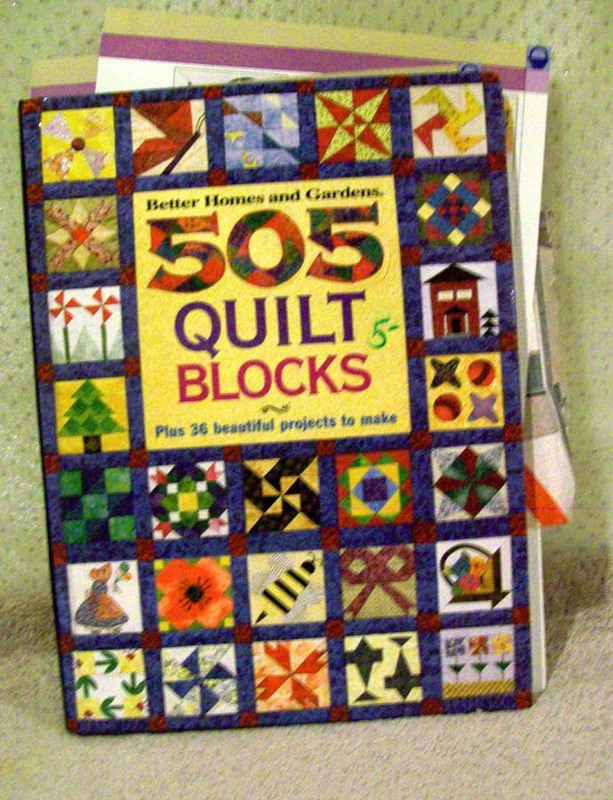 Perhaps someone around here would like to have a broken down quilt pattern book. Sure hope I use at least a couple of these.